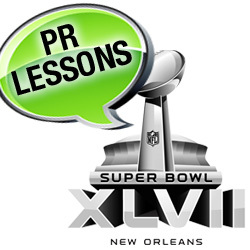 The 2013 Super Bowl was an exciting game that offered a number of useful lessons for legal marketers. Have heart: Chrysler reminded us of its deep-rooted brand by paying homage to our troops and our country, while Budweiser’s Clydesdales ad tugged at our heartstrings. Generate buzz: The advertisements are focused much less on actual products and more on generating buzz. The most outrageous, thought-provoking, humorous ads outlive their 30-second time-slots as they are shared via social media, reported by news outlets and discussed around water coolers. People are still talking about the popular “cat-herding” commercial from several years ago! Don’t go too far: GoDaddy and Volkswagen are facing backlash for their ads from critics and the public who say they crossed the line. Be prepared: You never know when the power will go out! If you see any other lessons to be learned from this year’s big game, let us know by commenting below.